Over the past few years, Ryan and I have had our Easter dinner in Lexington, Virginia - home of Washington & Lee University, the Virginia Horse Park and the Virginia Military Institute. This has nothing to do with my French Vinaigrette dressing, but this little town always brings a smile to my face so I need to share. We always stay in a little Inn right in downtown that's been there for hundreds of years - and so far we don't think it's haunted. The brick and cobble streets of Lexington wind their way past old and new shops, wonderful eateries and gorgeous campuses lined with old oak trees and sprawling green lawns. For some wonderful reason, it's always blue skies and sunny on the days we are there...never a spit of clouds. Our first time there, we went for a run in the morning around town and a road worker yelled out to us "good mornin' ya'll!" - and we fell in love with the place instantly. Not to mention the pub across the street sells vodka-sodas for $2.50. Anyways....this is where we spend Easter since my vacation runs through it and the past few years we have road tripped to South Carolina to visit my parents. It's pure bliss being in the south and I'll never get tired of it. 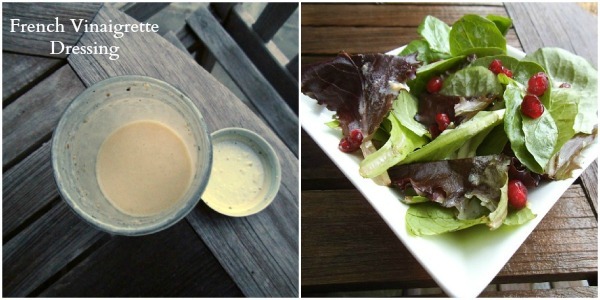 So on to the French Vinaigrette...its creamy, light, refreshing and absolutely delicious on mixed greens, over fish or garnished over roasted veggies. 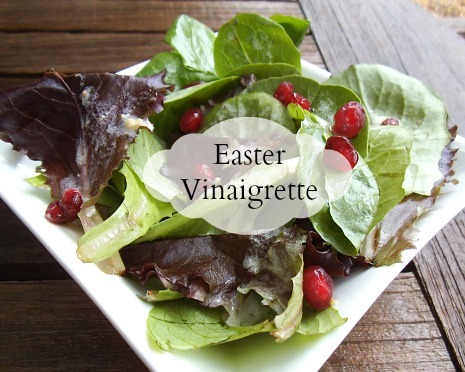 Your family is sure to love this dressing for part of your Easter dinner and hopefully you'll find yourself reaching for this recipe at every holiday like my family and I do every year.